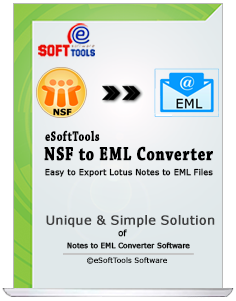 eSoftTools NSF to EML Converter is an ideal program to export notes and convert NSF to EML file. NSF to EML File Software successfully Convert lotus notes emails, contacts, journals, task, calendars and etc into EML file. NSF to EML converter software supports multiple and single selective NSF file/ folders for NSF to EML Conversion with maintains all emails formatting and properties. NSF to EML Converter software allows you to export notes complete data. You can convert s emails, contacts, calendars, and task, do list, and journals from single and Multiple NSF files. NSF to EML Software keeps the Meta properties (to, bcc, cc, time, subjects), attachments and formatting intact. No changes will be done while convert NSF to EML database. 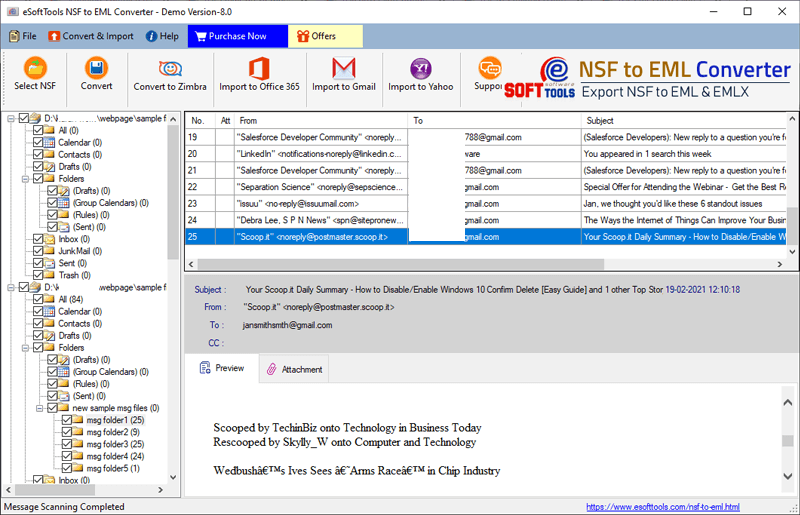 eSoftTools NSF to EML File Converter Software will allow users convert the entire items present within in lotus notes NSF file such as- contacts, calendars, emails, notes , journals and other items. You can also select the required folders/ items for conversion data into EML and EMLX format along with their complete data. Along with updated feature of NSF to EML Converter Software all users can convert now all database from lotus notes NSF file into EML and EMLX format without facing any difficulty. NSF to EML File Software never makes any changes while conversion and provides every preview steps of NSF to EML and EMLX conversion. NSF to EML Converter software maintains the folders structure of NSF file to Save the data and bow you can also convert all lotus notes NSF file to EML and EMLX format. Software promise not to make any changes in conversion process and keeps emails properties, attachments and other folders structure. eSoftTools NSF to EML Converter Software is 100% safe for using and provides best facility to convert names.nsf file of lotus notes to EML and EMLX format with maintains all emails data properties. 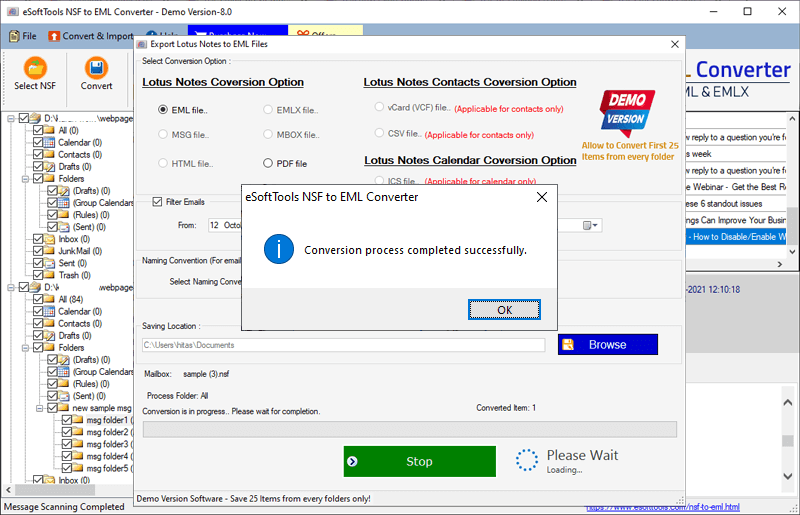 NSF to EML Converter software offers to convert selective single and multiple NSF folders/ files into EML format. 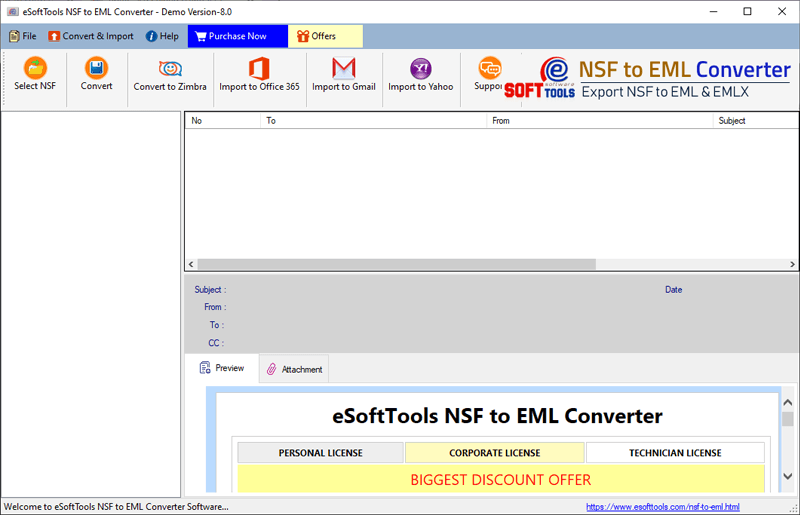 Try free demo of the eSoftTools NSF to EML Converter Software - Free Demo NSF to EML converter software can recover and export all EML files. Demo allows save 25 emails per NSF file folder into EML file format at free of cost. Do I Need to Install Lotus Notes application on machine for conversion NSF to EML? Yes, there need to install Lotus notes application on machine to install the software for conversion. What is the maximum size of NSF file that I browse for export data into EML? There no size limitation is provided by NSF to EML Converter Software, you can convert any size of NSF file into EML using software. Do I need to have MS outlook on machine for NSF to EML Conversion? Can I convert NSF file in bulk into EML format using software? Is it possible to convert selected folders from Lotus notes NSF file to EML using the same NSF to EML Converter Software? No, NSF to MSG Converter Software doesn’t have a size limitation for NSF file. You can add any size of NSF file to convert into MSG format.